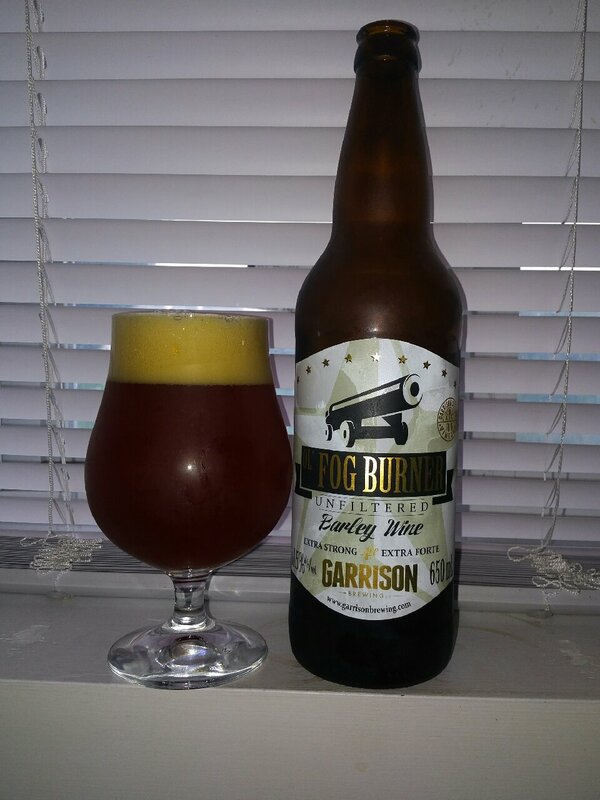 From Halifax Nova Scotia’s Garrison Brewing comes their “Ol’ Fog Burner Barley Wine” an unfiltered Ale. The beer pours a deep mildly cloudy Amber colour with a tan head. The aroma consists of toffee, tropical and dark fruits, floral hops lots of malts and alcohol. The flavour is of toffee, brown sugar, tropical and dark fruits, earth, bitterness, spices, bubblegum, mild alcohol and an overall sweetness. The alcohol content comes in at 10.5% and 60 IBU. This year’s version is in a 650ml bottle instead of 500 but also has a slightly lower alcohol content. I’m a huge Barley Wine fan and this one is great even though it tastes remarkably different than most of this style. Commercial Description: The biggest of all beers, Ol’ Fog Burner Barley Wine is an exceptionally mellow and complex ale. Its; tawny copper colour, caramel and spicy flavours transcend boundaries and expectations. Suitable for cellaring. Cheers!